RSVP - Grand Purim Bash - Thursday! The Grand Purim Bash is this Thursday! Have you made your reservations? 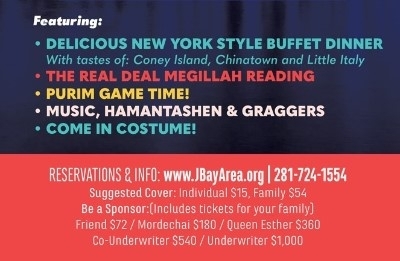 Invite your family and friends to join you... "Purim in New York!" will feature a delicious dinner with tastes of Coney Island, Chinatown and Little Italy, and lots more! Hey Kids, Get into the holiday spirit with this fun Pre-Purim event! We'll be making our very own Hamentaschen - with all kinds of fun fillings - and lots more! 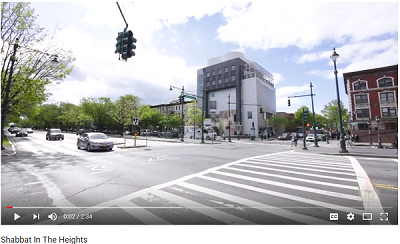 Hear the Megillah - Purim Eve & Day! One of the Mitzvot of Purim is to hear the Megillah read on both the Eve of Purim and Purim Day. 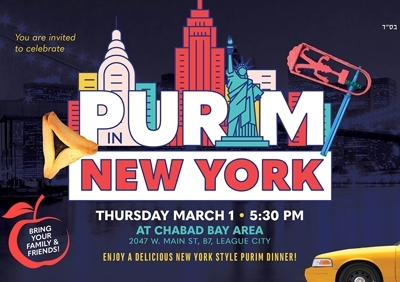 Join our grand Purim Dinner - 'Purim in New York' - to enjoy the Purim Feast in all its glory! Advance RSVP kindly requested. If you might be interested in joining in with a group from the Bay Area of Houston, please contact to Rabbi Yitzchok or Malky Schmukler. Service followed by Kiddush lunch w/ hot cholent!